I have been really impressed with Armello, as it blends board-game like mechanics with really fun gameplay. It has a new DLC out which brings in a bunch of new characters. You're essentially trying to either kill the king, or take over from him before time runs out. You scramble around the board trying to win in different ways and it's really quite an experience. This DLC sounds like it will make things even more fun! Magna, The Unbroken - Tank-like member of the Wolf Clan who can reflect opponents' attacks. Elyssia, Wardress of Warrens - Hero of the Rabbit Clan who builds fortifying walls around settlements. Ghor, The Wyldkin - Bear Clan champion whose magical powers are increased in forests. Sargon, The Death Teller - A legend of the Rat Clan whose cards appear face up when selecting which ones to draw. 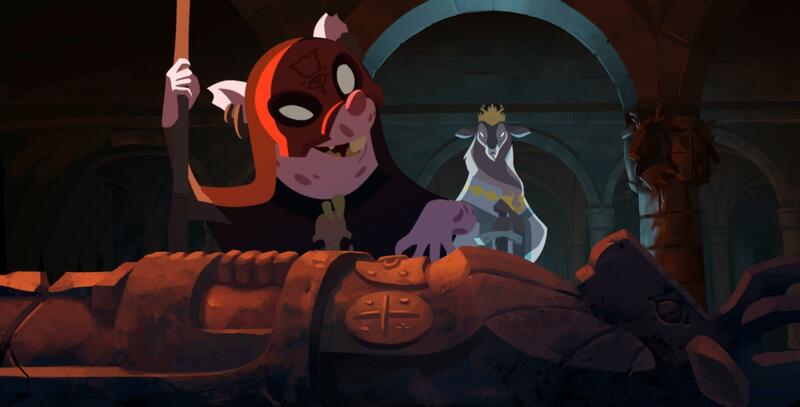 Have you played Armello? Let us know what you think in the comments! You can find the new DLC on Steam. The main game is on both Steam and GOG, but it appears GOG doesn't have this DLC. Armello is a fantastic game wth a top-notch presentation. Not perfect but very, very good. My only criticism is that there's not much to do "off-turn" other than look for opportunities to use some of your cards. Otherwise, you're just sitting and waiting for other players to finish their turns so you can play again. Thankfully you can put the AI on fast-turns which makes the game go much faster, but this is obviously not an option when you're playing with other humans. Other than that, it's very fun. I keep hoping League of Geeks will address this shortcoming with a future expansion. I'll definitely give the new characters a try once I get some cash. I would advise anyone against buying this game on GOG, the developer of this game has proven to be rather lazy (or incompetent) in providing a DRM-Free version on par up with Steam, according to what they say "they can't provide DLC to DRM-Free users" it has been a heavily discussed issue for a couple of days now already, Link To Thread. Regardless of how good the Steam version may be, this is one dev that's going straight to my never-to-buy-from list. Damn fun game. I'm not sure I can justify spending £7 on four new characters though. I'll add it to my wishlist and hope for a sale. Avehicle7887 Regardless of how good the Steam version may be, this is one dev that's going straight to my never-to-buy-from list. I'm honestly baffled by this anti-Steam sentiment. If not for Steam and Valve's efforts in promoting Linux gaming, we wouldn't even be having this discussion. Refusing to buy from Steam is a bit like cutting off your nose to spite your face. Avehicle7887 ...it has been a heavily discussed issue for a couple of days now already, Link To Thread. Honestly, not seeing much discussion in that link. Lots of bitching and moaning, though. I have mixed feelings about Armello. It seems well designed and interesting, but actually playing it kind of frustrates me because of how long it takes, how much is going on and how little you can influence it. It's supposed to be a digital board game, but it has a lot of aspects that would be terrible on tabletop. Out-of-turn manages to feel both boring and too short depending on whether you have a new quest to select, whether you have any cards to play out-of-turn and whether other players play cards on you. Since you can't do anything when engaged by another player in combat, or play cards against players dealing with perils or fighting or moving, you're constantly trying to time actions that in real life would be as simple as saying "Wait, I'm playing this card on you before you leave that space." And while you're choosing quests or equipping items, you can't see what's going on on the board so you lose track of who's where and what they gain. Anyway, I have a free code for the DLC if someone wants to arrange some kind of trade for it. But I feel like this being more problem of GoG not caring. I can see that if GoG offered some kind of support for devs to efficiently and painfully update their games (which seems like steam provides), they would gladly did it. Mountain Man I'm honestly baffled by this anti-Steam sentiment. If not for Steam and Valve's efforts in promoting Linux gaming, we wouldn't even be having this discussion. Refusing to buy from Steam is a bit like cutting off your nose to spite your face. Well, that's the kind of statement that you expect from an *buntu user that most likely has been using Windows until a few years back (or even still uses it). If the people behind GNU and Linux had had your attitude, we indeed would not have anything to discuss about right now. Not that it matters but I have used Linux as my primary OS for nearly two decades. I experimented with Red Hat and Mandrake at first before settling on Slackware, moved to Gentoo for a long stretch, and switched to Kubuntu several years ago because it's easier to manage. Lately I've been looking at Debian and OpenSuse (Yast is pretty slick) but haven't decided if I want to make the switch. I kept Windows around exclusively for gaming, but thanks to Valve and the dramatic advancement in Linux gaming over the past couple years, I was finally able to wipe my Windows partition without giving up my favorite hobby. Does that sufficiently establish my Linux "cred" to allow me to express my opinion? I don't read this as anti-Steam sentiment, more of a "the developer doesn't support store fronts they agreed to support (by offering their product there). Maybe this isn't the kind of developer we want to put our money toward." Mountain Man Honestly, not seeing much discussion in that link. Lots of bitching and moaning, though. With all due respect, why is that such an awful thing? They choose to buy a game expecting full support, that support was pulled. Can't people vent their frustrations? Why be so dismissive of a pretty normal human reaction? Yes, a full game. But not containing all gameplay content. That is a troubling trend. Colombo But I feel like this being more problem of GoG not caring. I can see that if GoG offered some kind of support for devs to efficiently and painfully update their games (which seems like steam provides), they would gladly did it. Or they have less funds than Steam and can't always match toe-for-toe some of the features Steam provides. Yes, they should work on it (and do), but failure to be 100% like Steam should not be a criteria for dismissal. Their methods of updating may not be ideal, but it can't be that bad if GOG has been around for this long and continues to expand their library of games. I really like some of the things Steam has done (linux support and their gamepad for certain), but I have a hard time understanding consumers who seem rigidly pro-Steam. Apparently this is not unique to Armello as there are a number of newer games that have been similarly "abandoned". I guess GoG doesn't have agreements or systems in place to simplify or encourage long-term support. If developers find it easier to simply "abandon" their games instead of continuing support through your storefront then you as the shop owner need to figure out why. It's not all on the developers.